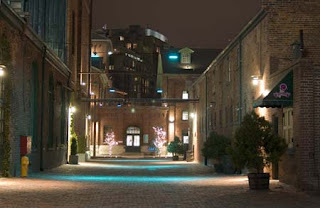 Deacon Dr. Fresh Wine Newsletter: The Deacon, the Distillery District, and Jack the Ripper! The Deacon Tours New Zealand! Final Results for Ontario Wine Awards 2007! The Deacon, the Distillery District, and Jack the Ripper! Deacon Dr. Fresh AKA " The Deacon"
I arrived at 55 Mill Street in the Distillery District at approximately 5:20 PM, by taxi. It was already dark, and damnably cold, and I began to search for Building 4, the location of Gibsone Jessop Gallery where the Foster's Wine Event was taking place. It was getting damp, and I pulled my Inverness cape tightly about me in defense against the wretched chill. Call it a premonition if you like, but I shivered as I opened the door of the hansom cab and then the driver made an odd comment just as I was climbing down to the kerb. He said "Perfect night for a murder." He said that to you? I think so. But I didn't hear him clearly as his horse neighed at that moment. I suppose he might have said "Step carefully sir". He was very colourful though. Are you saying he was a black fellow? No, he was just colourful. You know...dressed in festive harlequin clothing as one sees so much these days. Is that when you found the body? No. I began looking for the gallery where the wine tasting was to take place. It was very deserted though, and I felt like I'd stepped into the 1880's, the era of the Whitechapel murders. It was especially eerie in light of the driver's comment when I paid him the 8 shilling fare. What did he say then? Hard to be sure, really, what with the noise of the wind. It was either "Try not to get your jugular vein slit, governor! ", or it might have just been "Good night sir!" What occurred next? Is that when you found the corpse? No inspector. It took me awhile to locate building 4 as I mentioned. It was really quiet though. Just the sound of the wind and the usual cackling call from the prostitutes that one typically encounters in the Distillery District at that hour. Well...I was just turning the corner of one of those restored liquor buildings, and then I saw it. There on the ground, next to a few rubbish bins was a decrepit old slag dressed in cheap black lace - she looked like a street walker with all that makeup - and she was crumpled in a heap with her throat slit from ear to ear. Was there any blood you could see? Well that's the strange thing. With such an affront to the throat, one typically expects to see a lot of both bright arterial and darker venous blood. Also, I would expect some degree of post-mortem lividity, depending of course on how long the corpse has been lying there. But there was none. No evidence of blood anywhere near the body at all. Well...I knelt down under the gas lamp for a better look. That's when I realized I was looking at a burlap sack full of bottles that had been left next to the dustbins. It must have fallen over. Then the absence of blood made complete sense. I'm sure it did. So you didn't see any dead bodies yet? Not yet, no. Instead I found the gallery and was glad to get inside. I felt like it was a real relief getting indoors and all. Because you knew there was a murderer about? No, it was just a lot warmer inside. Who was there at the Gallery? Rama Zuniga, the woman who sent me the invite from Foster's Wine Estates Canada...Beppi from the Globe and Mail...Also Dean Tudor and Michael Pinkus, the wine writers, who were seated at a table crowded with glasses half-full of red liquid. Are you referring to drinking different blood types? No. Just some Californian and Australian red wines. Because of the Stag's mythical connection to the horned god of witchcraft? I looked around the brick walls and at the smiling servers, all doing their best to act so natural, and I realized that the Zodiac killer's reign of terror was in San Francisco...California. He was never caught, was he? That's what I thought. And when you add the fact that Jack the Ripper was never caught either, it all started to make a terrifying sense. Another reign of terror, or in this case a "reign of terroir" was about to take place. Is that when the murder happened? No, not yet. More of the attendees kept arriving, and I began sampling some more of the wines with Dean Tudor and Michael Pinkus, including "The Grange", Australia's most famous red wine. Then things got both strange and dangerous. How specifically did things get dangerous? Well...Pinkus swirls his wine a little too vigorously. Think of a combination of a blender, a cement mixer, and that Rotor ride at the CNE. He wobbles it while he swirls, and he doesn't look at the glass either, because he's too busy talking. I couldn't help thinking that someone was going to get wine all over them. Yes. And when you factor in the way the earth will wobble when the Mayan calendar ends on December 21st 2012, it all gets so terrifyingly clear. I noticed too that the walls were made of rather old granite. I couldn't help but think how dangerous one of those blocks would be in the hands of a killer. You'd just have to rip one out of the wall, approach a victim quietly and use it to smash in his brain pan. Indeed. What was Tudor doing at this point? Are you saying he's a high-ranking Satanist who has sold his soul to the devil in return for some sort of occultic gustatory dining power? No. I think he's probably just got big hands. Plus he's been to a lot of these events and knows how they work. Well...I recall sampling some beautiful Wolf Blass Platinum Label Shiraz that tasted like pepper and blueberry juice. It was quite delicious. Just then, a man with glasses who must have worked for the gallery, glared at Pinkus and gave him a really dark look. Are you saying the man with glasses was a black man? No. He was just angry. I think he thought Pinkus was going to splash wine on the artwork. Did you ever see that movie where the man goes insane in an art gallery and splatters blood all over the paintings? The Remains of the Day? The film you're referring to...Were there lions in it that wandered away and then came back? No...I think that was Born Free. Well like I said, I was sipping this incredible Wolf Blass Platinum that probably goes for forty pounds a bottle, and I began to feel really dizzy. Everything began to spin and I saw Pinkus grinning at me through a shimmering miasma of purple and black. So Michael Pinkus is a coloured chap? No the miasma was purple and black. I remember thinking just before I lost consciousness that this was the end. I recognized the unmistakable symptoms. I'd been slipped laudanum and would be found in the alley with my own carotid severed, surrounded by Zodiacal symbols, written on the ground in chalk. More and more people kept arriving and there were a lot of canapes circulating, and a huge amount of high-cholesterol cheese - brie and such - on the table. It suddenly struck me that in such a crowd, if the Ripper was present and was carrying one of the skewers from the tikka chicken and had dipped the tip in cyanide or ricin, he could easily mingle and stab people at his leisure. By the time we noticed people collapsing around us in agonizing death throes it would be too late and he'd get us all. At this point, I took to standing with my back to the wall to better defend against a ricin attack. Is that when the murder happened? Did the killer use this moment to strike? No. Although a very frightening thing happened just then. Pinkus had taken to swirling his wine even more violently and I suddenly noticed a man staring downward, but in Pinkus' direction. He was holding a Taser, getting ready to shoot him. I grabbed a metal tray from a waiter and thrust it between them to deflect the high-voltage darts. But he must have missed Pinkus though, because he's unharmed. Yes, he's actually fine. It turns out it wasn't a Taser at all. It was just an old-style cel phone and the man was staring at the keypad as he made a phonecall. He just happened to be facing Pinkus at the time. Well...it was getting a bit stuffy and so Pinkus and I decided to go for a beer and some food - you know; a sit down dinner. There'd been a lot of great appetizers and the event was a huge success, but it was just time to leave. On our way out, the organizers gave us each a black paper bag with some items in it. A sharp corkscrew, a Christmas CD, a small plastic penguin and a bottle of red wine. It was all very Gothic and terrifying. Especially the black bag. I kept thinking of charred bodies and dental records. Then I realized that all the attendees would get identical "gifts" and we'd have 60 drunken wine fanatics, wandering the Distillery District in the dark with miniature, symbolic black body bags containing razor-sharp corkscrews and plastic penguins. I had a really horrible feeling about the way the evening was headed. Well...he was still eating...a lot...but I thought he'd join us for dinner. Yes. I remember thinking how extraordinary it was that he'd eat continuously from 2 PM, but then wouldn't come out for dinner. How did he seem? Frightened? No, not frightened. More...preoccupied. Like he had another appointment...an appointment that he couldn't talk about...It was very odd. He was all for dinner and really went out of his way to make Dean welcome. You know...we wanted him along. He's got a tremendous sense of humour. He can be quite dark! Are you stating for the record that Dean Tudor is a black man? Well...The three of us headed out into the night...into the dark... As we made our way through the damp, cobbled streets, naturally I was on full alert. In the pocket of my Inverness, I cradled my Webley Break-Top revolver. If the Ripper and Zodiac were creeping about, I was going to go out in a blaze of glory. That's when the three of us, walking together through the cold wind, suddenly reached the crossroads. Like Robert Johnson. The black chap who sold his soul to the devil to be able to play the blues? No. Just the crossroads of Mill Street and Trinity. Then we found the Mill Street Brewery. Michael Pinkus said something about us being the three musketeers. I jokingly said something like: Yeah, Mickey, D'Artagnan, and Darth Vader. It seemed hilarious after all that wine. That's when we separated ways. There was a sprinkle of snow in the air and a snowflake made my eye tear as Dean walked away into the darkness. I can still hear his feet clattering on the cobblestones. I never saw him again. That's when he was murdered? No...I expect he just went home on the streetcar. Lucky thing really, when you consider what a bloodbath it could have been. My pleasure, Inspector Gregson. Always glad to help the police. I loved your using the word "kerb" -- it so sets the tone..Kerb your enthusiasm? Never!!! Keep on writing, maybe the 'black horse in the swiss night' will visit you again.